Posted on Wed, Jun 27, 2012 : 12:15 p.m.
After seeing each other for 16 straight seasons, Michigan and Notre Dame will take a short break. The Michigan football program announced several additions to its future non-conference schedules Wednesday, and also reaffirmed a two-year hiatus with the Fighting Irish in 2018 and 2019. According to a university release, Michigan and Notre Dame will not play each other during that two-year stretch, but do intend to "resume the rivalry in the years following." The Michigan-Notre Dame rivalry will take a two-year hiatus in 2018 and 2019, but the schools intend to "resume the rivalry in the years following," according to a release from Michigan. After taking a two-year break in 2000-2001, the Wolverines and Fighting Irish have met each of the past 10 seasons. The series will continue to be an annual event through 2017 before taking the two-year break. In 2010, Michigan athletic director Dave Brandon said neither school had actually signed the previously agreed-upon 20-year contract, and that the series would eventually get a two-year break beginning in 2018. The two-year break allows both clubs to schedule home-and-home series with other opponents. Michigan has won five of the last six meetings with Notre Dame, and leads the all-time series 23-15-1. Also on Wednesday, the university unveiled its non-conference foes for the 2014 and 2015 seasons, and part of the 2016 year. In 2014, Michigan will officially take part in the Big Ten-Pac-12 scheduling alliance by hosting Utah at Michigan Stadium on Sept. 20. The Wolverines will open the 2014 season with a home game against Appalachian State on Aug. 30 before visiting Notre Dame on Sept. 6. From there, Michigan will host Miami (Ohio) before welcoming in the Utes -- who most recently handed Michigan a 25-23 home-opening loss in 2008, the first game of Rich Rodriguez's tenure in Ann Arbor. In 2015, Michigan will pay a return visit to Utah when it opens the season on Thursday, Sept. 3 in Salt Lake City. The date will mark the first time in Michigan history that the Wolverines will play a football game on a Thursday night. It will also be the first game played in the 2015 college football season. Also in 2015, Michigan will host Notre Dame on Sept. 12, Oregon State on Sept. 19 and UNLV on Sept. 26. The Wolverines are 4-0 all-time against Oregon State, with the most recent meeting resulting in a 31-12 win in Ann Arbor in 1986. Michigan has never played UNLV. The 2016 schedule presently has two open non-conference dates, but does include a road game against Notre Dame on Sept. 10 and a home game against Colorado on Sept. 17. Michigan is 3-1 all-time against Colorado, including a 27-3 win to open Michigan's 1997 national championship season. The most memorable moment in the Michigan-Colorado series, though, came in 1994 when former Buffalo quarterback Kordell Stewart hit Michael Westbrook with a 74-yard hail mary touchdown pass as time expired, giving Colorado a 27-26 win in Ann Arbor. Sat, Jun 30, 2012 : 5:43 a.m.
Thu, Jun 28, 2012 : 10:40 p.m.
How do you treat a child that won't share his toys with others? You call &quot;time out&quot; and set him on the sidelines until his behavior is modified. NOBODY in the the Big Ten should schedule Notre Dame until they change their ways. ND hogs FB revenue and does so at the Big Ten's expense. ND routinely schedules &quot;local&quot; teams like Purdue, Indiana and Blue and &quot;uses&quot; the Big Ten as their &quot;default conference schedule&quot; without sharing the revenue as the &quot;rest&quot; of the schools do. Thu, Jun 28, 2012 : 1:19 p.m.
Utah ain't soft, they came to the Big House 4 years ago and left with a W. They are also in the PAC 10, or sister conference who for whatever reason we have to hold hands with going forward to protect a bowl game in an old outdated stadium with pretty scenery from one side of the stands. Get on board or get left behind folks, we can't have Slipperry Rock in here to keep the naysayers happy anymore. Thu, Jun 28, 2012 : 10:51 a.m. It is unfair for anyone to say that future competition is &quot;soft&quot;. You, me, nobody knows how good Oregon State, Colorado or Utah will be when those upcoming seasons come around. Heck, prior to last year Michigan could have been viewed as &quot;soft&quot; over the previous three seasons. Go Blue! but be realistic with respect to future schedules excluding MAC and FCS schools. Thu, Jun 28, 2012 : 2:03 a.m. This soft out of conference scheduling stuff needs to end. Too bad it won't any time soon, from the looks of it. Thu, Jun 28, 2012 : 12:01 a.m. The Thursday night game has an interesting match-up but is scheduled for the wrong day of the week for Michigan football! On another note, Michigan should schedule more SEC opponents instead of MACs. Wed, Jun 27, 2012 : 11:27 p.m.
A couple of things here: 1) Thursday night football is disappointing. College football needs to stick to Saturday. 2) If you schedule a home and home with U Dub here in Seattle, you're guaranteed to get money from me. There are so many Michigan fans out here, and we'd love to take over Husky Stadium. Wed, Jun 27, 2012 : 9:17 p.m.
As far as I'm concerned this is not good. But I guess the &quot;Old School&quot; match ups just aren't attractive any more. Money drives everything. Although when you talk about Utah, Colorado, UNLV and Oregon State none of those sound attractive whatsoever. I guess if Michigan is going to return to National prominence you need to schedule schools that are preceived to be automatic wins on your schedule. Utah has had some good years in the past and the other schools are mediocre at best, but I prefer quality competiton. If they replaced Notre Dame with USC, Oregon or maybe Boise State then I'd be interested. But Michigan should be thankful that I have nothing to do with the opponent selection process. Wed, Jun 27, 2012 : 8:24 p.m. It's a real shame to lose notre dame from the schedule for two years. There are quite a few people and media authorities that view that matchup as just as good or better than the Michigan vs ohio game. We are also always treated very well by their fans in South Bend, win or lose. 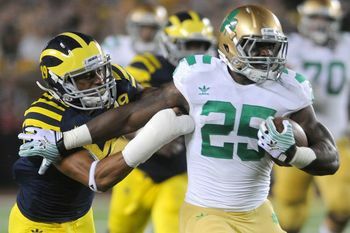 The college football season just doesn't seem the same without Michigan/ notre dame. MgoBlueForTiM........Bring back the irish ! Thu, Jun 28, 2012 : 12:14 a.m. Wed, Jun 27, 2012 : 9 p.m.
Agree with everything you said, but it is nice to vary up the schedule a bit. I would just to replace them with other big time talent or name, and would prefer to see ND replaced with Texas or Tennessee, or some school like that (you never know what the opponent's record will be, but replacing ND with UNLV comes up a bit short). Wed, Jun 27, 2012 : 8:01 p.m. This has to do in part with the new Top 4 playoff system. Notre Dame is attractive but has not been Top 25 material. The newly added opponents may not be much better but it is good to play outside the conference. Too bad App State was added in 2014. They are not the same team that upset Michigan in 2007. Wed, Jun 27, 2012 : 8:05 p.m.
that App State game is infuriating. There is nothing for michigan to gain by playing it except for rehashing terrible memories for all the fans who had to witness it the first time through. We are yet again expected to win. doing so adds nothing, but failing to do so takes away everything. It's terrible scheduling, but par for the course with this AD. Wed, Jun 27, 2012 : 7:52 p.m. I thought Thursday night games were reserved for the Big East, or any mediocre team that was craving any bit of attention they could find. Wed, Jun 27, 2012 : 8:18 p.m.
Uhm, the majority of Thursday night gameson ESPN have BCS conference teams playing. Take a look at last years schedule http://www.gamblerspalace.com/sports_thursday_night_football.htm or this years schedule http://espn.go.com/college-football/story/_/id/7621355/espn-networks-2012-college-football-schedule Plus, it is the first game of the season for anyone. Wed, Jun 27, 2012 : 8:03 p.m. It's great from a recruiting standpoint and marketing standpoint if you're a team like Boise State, or some other middle of the run team (you don't see florida playing on thursday). This provides no gain for michigan, we don't really compete for ratings, regardless of when/what channel we're on. Wed, Jun 27, 2012 : 7:55 p.m.
@ Forever27, for what its worth, the SEC has played thursday night games. They are good games to play because there is no other competition on the TV, great from a recruiting standpoint and a marketing standpoint. The bars will be full. Although, makes me thnk I will take off up north early that weekend and watch the game up there after a day on the lake. Wed, Jun 27, 2012 : 7:51 p.m.
Encouraged to see big conference foes, rather than more App state type teams. I am also happy that they are going on the road to a big time stadium (except for ND). Salt Lake City is a beautiful city to visit--the players should like seeing the Tabernacle, the mountains, etc, and I think Tyler Ecker is from there so he can play host. UNLV is a bit of a step up from UMass and some of the other schedules, but where are the southern schools?? Looking forward to P12 teams like USC and Stanford--though admittedly, Stanford has not been consistently elite like it was during JH's last 2 years. Wed, Jun 27, 2012 : 8:55 p.m. I am talking about into the future. I hate that we lost, but my comment is not about that. It is about the type of team that I think a big school like Michigan should play--they should try to get an elite schedule, full of national teams, sort of like it was before the mid 1990s. Big conference teams. Not all top 10, but at least Div I BCS (formerly) teams. I actually fear scheduling nationally will get even worse (read: more downscheduling) now that there is a 4 team playoff without clear guidelines how to make that top 4. I hope Michigan does not do that, and the first couple of years, it sounds like they will not. Wed, Jun 27, 2012 : 7:53 p.m.
you do realize that App State is actually on that schedule. you couldn't get more &quot;app state type team&quot; than that. Wed, Jun 27, 2012 : 6:34 p.m. I'd like to see the &quot;Old Ball Coach&quot; on the visitors sideline before he retires. Wed, Jun 27, 2012 : 7 p.m.
A home-n-home deal with USC (no, not &quot;that&quot; USC) would be great! Wed, Jun 27, 2012 : 5:56 p.m. Thank Goodness. We need a break from that team, as long as they don't just add another MAC team instead. Wed, Jun 27, 2012 : 5:27 p.m. I'm glad we are playing Utah again. They are an exceptionally well coached team. People want to forget when they kicked our behinds in the big house during the Lloyd Carr era- along with most every team with speed who ran the spread. Love what coach Hoke and his staff have done. Please don't take us back to the Lloyd Carr era. Keep recruiting speed. Wed, Jun 27, 2012 : 7:04 p.m.
Lloyd Carr did coach vs. Utah in '02 but won that game by a slim margin. Wed, Jun 27, 2012 : 6:58 p.m.
Are you talking about the last Utah game in Michigan? That was Rich Rod and it was a two point loss. Wed, Jun 27, 2012 : 5:11 p.m.